Bengaluru: Royal Challengers Bangalore (RCB) skipper Virat Kohli said giving excuses after every match were not the option, as his team slumped to sixth straight defeat, this time at the hands of Delhi Capitals, here on Sunday. RCB could only manage 149 for nine after being asked to bat first. Kohli scored a patient 41, but the India captain did not get support from the other end. Delhi rode on Shreyas Iyer’s 67 to reach the target with seven balls to spare. On his innings, Kohli said he had to stem the rot when AB de Villiers got out. “When AB got out I had to dig deep, the other guys had to strike around me. Stoinis was good, Moeen (Ali) was good and Akshdeep (Nath) too. When there are two senior batsmen and one gets out, the other has to take charge. That’s the whole idea. Kohli also said he wasn’t happy with the way he got out. “The pitch didn’t allow us to play freely. Understanding the situation and targeting specific bowlers, I wasn’t too happy to get out to a ball like that. If I had stayed, we could have added 25-30 more to the total. In hindsight, we can look at all this. But 160 was a competitive total,” the RCB captain said. South African pacer Kagiso Rabada scalped four wickets to restrict Bangalore. The South Africa pacer (4/21) bowled a brilliant 18th over to snare three wickets, including that of Kohli’s, to stem RCB’s run flow. In the final over, he gave away just seven runs. Iyer (67; 50b, 4x8, 6x2) made the most of a reprieve — he was dropped on four by Parthiv Patel in the first over off Tim Southee — to bring up his 11th fifty in the IPL as he joined hands with Prithvi Shaw for a 68-run second wicket partnership. There was a little flutter when Chris Morris (0) was dismissed in the same over and then Rishabh Pant (18) too departed in the next. But Axar Patel hit a four off Mohammad Siraj to close the game. De Villiers (17) failed to continue the fireworks from the last game and holed out to Ingram at long on off Rabada. Delhi Capitals beat Royal Challengers Bangalore by four wickets. 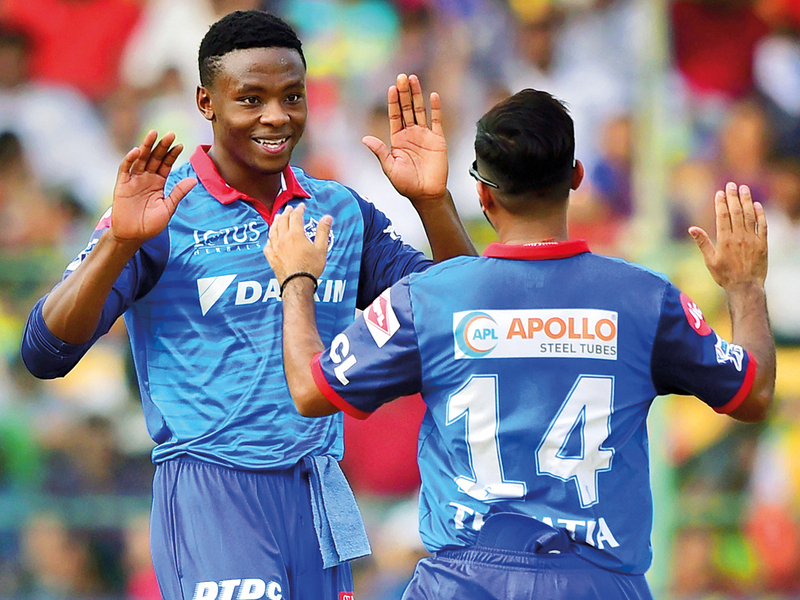 Royal Challengers Bangalore 149 for eight (Virat Kohli 41; Kagiso Rabada 4/21) Delhi Capitals 152 for six in 18.5 overs (Shreyas Iyer 67; Navdeep Saini 2/24).